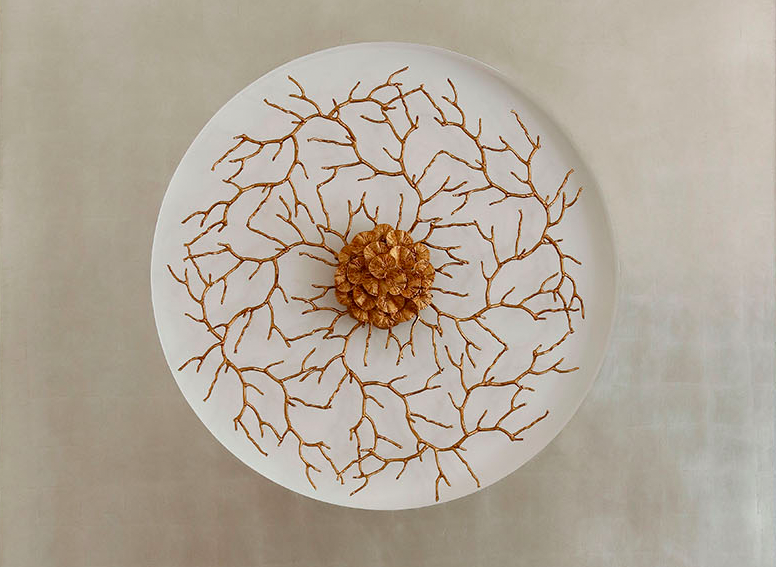 Adding a touch of refreshing coolness to a villa or recalling the natural world in a city pied-à-terre…Stéphanie Coutas meticulously examines every element of her designs, working with the very best artisans to create bespoke interior spaces. Discover a selection of some of the most gorgeous seaside-inspired pieces chosen for you by SC Edition. Ocean-blue and wood grace these stunning 1950s-inspired armchairs given a fresh, contemporary twist by Dutch designer Montis. The modern beech frame is tempered by the gorgeous blue velvet fabric. Luxury and comfort in perfect balance. Stretching out like an endless ocean, this super-sized rug was designed by House of Taï Ping, known around the world for its high-end hand-tufted and hand-knotted carpeting. 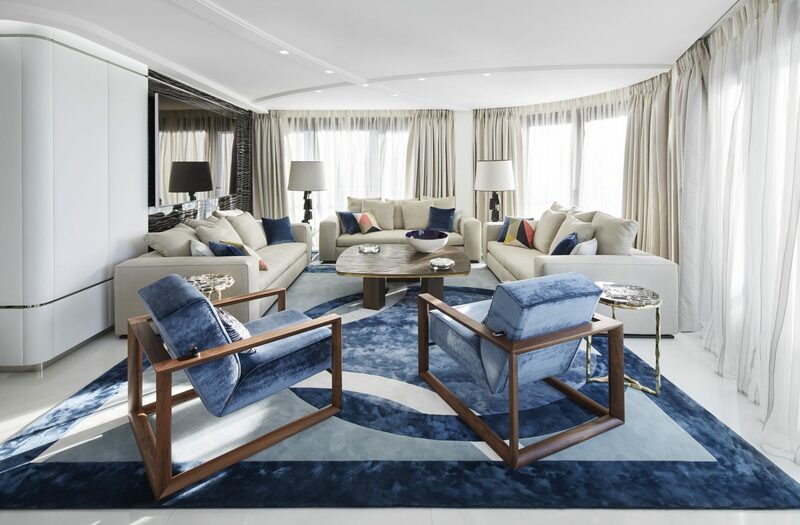 An epic statement piece, it creates a visual link between the bedroom and the living room in this penthouse on Cannes’s famous La Croisette. A harmonious blend of blue and sandy white beautifully enhances the sense of space. Handmade in Portugal from bronze metal and hand-blown glass. This bronze wall sconce represents a stunning piece of coral reef and was customised especially for SC Edition by SERIP. The unique craftsmanship poured into each SERIP lighting creation creates a distinctive work of art. 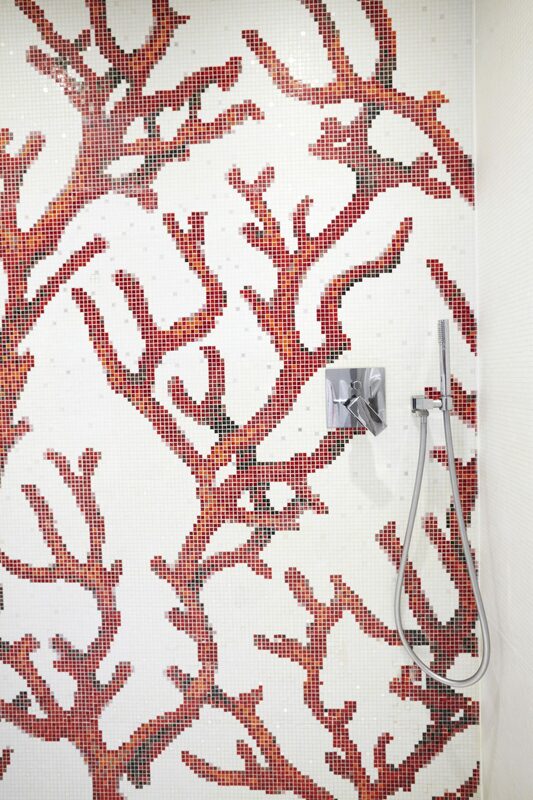 Our second coral-themed piece is this extra-wide mosaic-covered shower stall from SICIS, The Art Mosaic Factory. The Italian designer specialises in crafting unique, poetic decorative schemes. This pearly white and orange coral motif is achieved by each tile being carefully applied by hand – the result of many long hours of work. A twist of vibrant colour gives a dreamy effect. 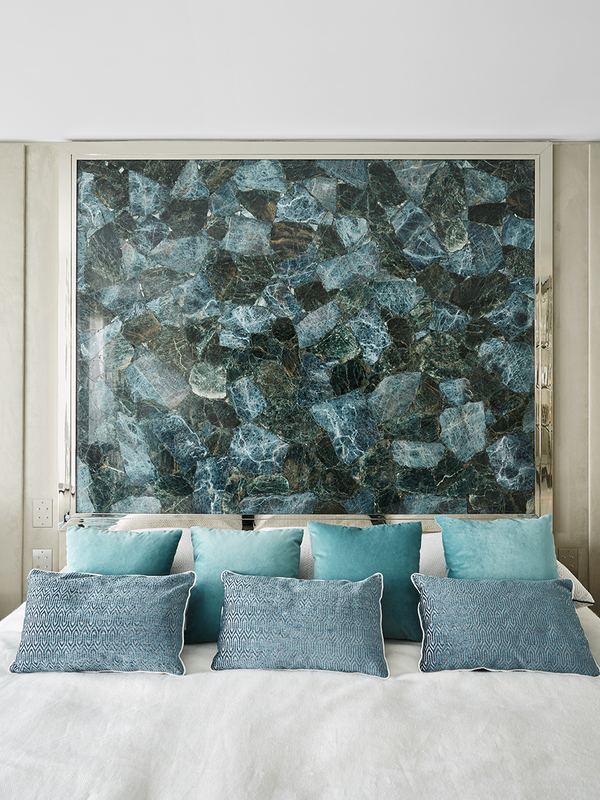 For this master suite, Stephanie Coutas designed a luxurious apatite headboard featuring a chrome frame in deep shades of ocean blue. The innovative use of marble here is illustrative of the bold creative flair that defines SC Edition and its ability to use raw materials in unexpected ways with lyricism and sophistication. 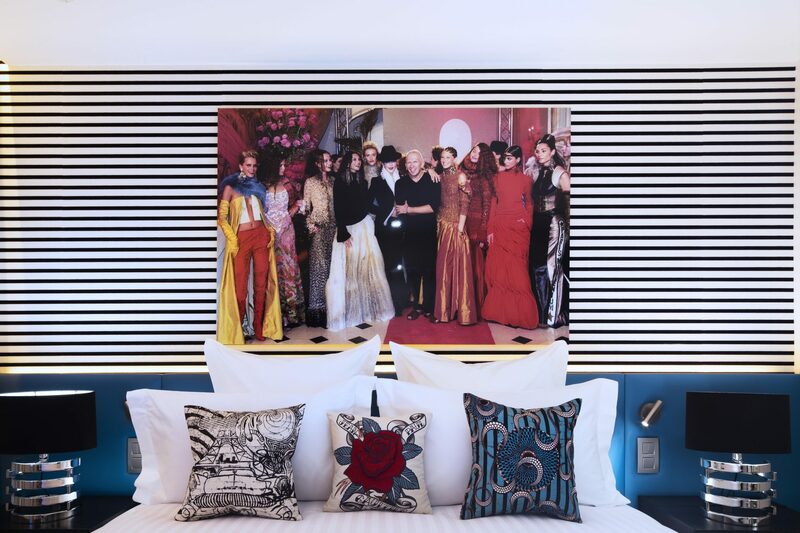 Textures and patterns come out to play in this Dress Code Hotel room in which Stephanie Coutas experimented with the Sailor stripe: a royal blue headboard features striped upholstery, with the motif reiterated in the en-suite bathroom. A nod to one of France’s greatest designers. 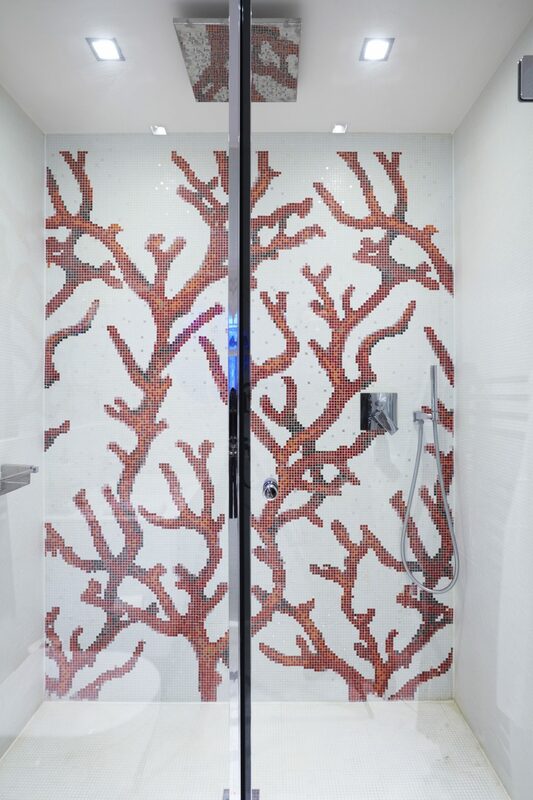 This walk-in shower is inspired by turtles. 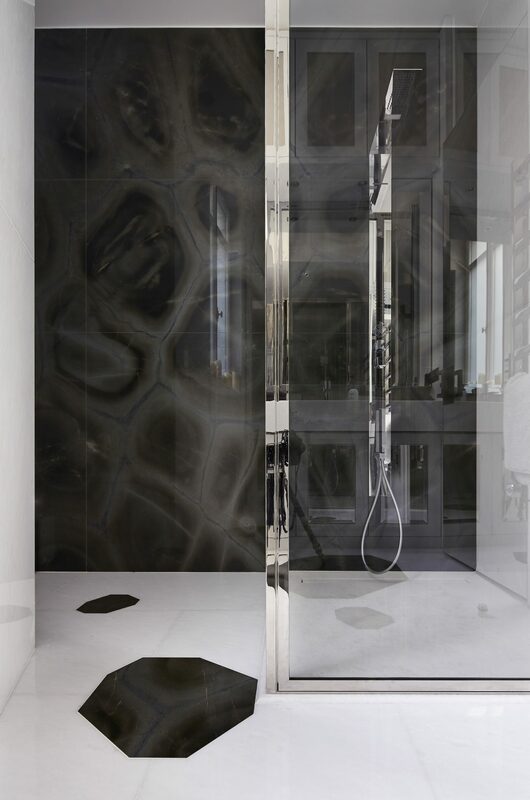 The spectacular turtleshell pattern is made from Green Turtle marble, contrasting with the white glass stone shower floor. 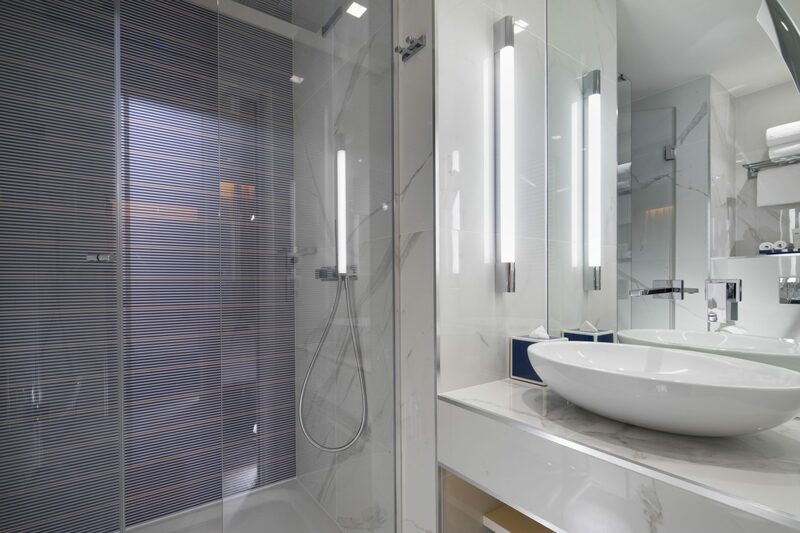 The result is a novel, luxurious finish lifted by chrome contouring around the glass panels and the Gessi shower column.